Post course, I LOVE hearing how couples make hypnobirthing their own! Indeed, I thought I'd share a wonderful example in case it's helpful for your own practice. I’m now well into my preparation for the birth. 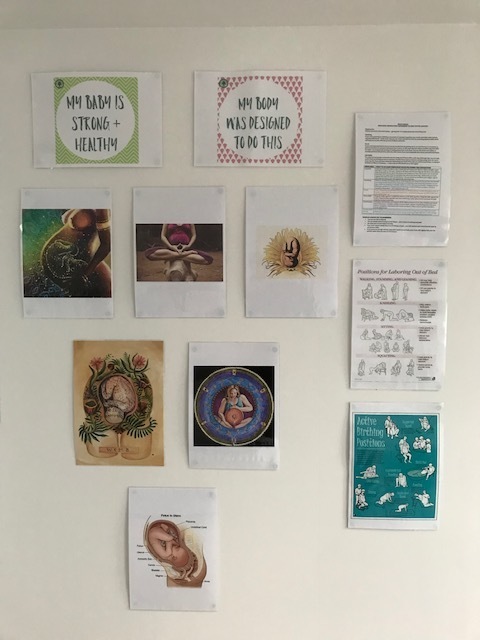 My ‘birthing room’ at home is covered with motivational quotes from the Hypnobirthing Place website, active birthing positions and imagery (lots of waterfalls as you mentioned and downward facing “baby in womb floral art” - my google search history must look very peculiar!). I’ve just started drinking loose raspberry leaf tea this week and started eating dates (only a couple though and will increase closer to the time)! In my birthing room I’ve also got all of my aromatherapy, including clary sage for when I go into labour. 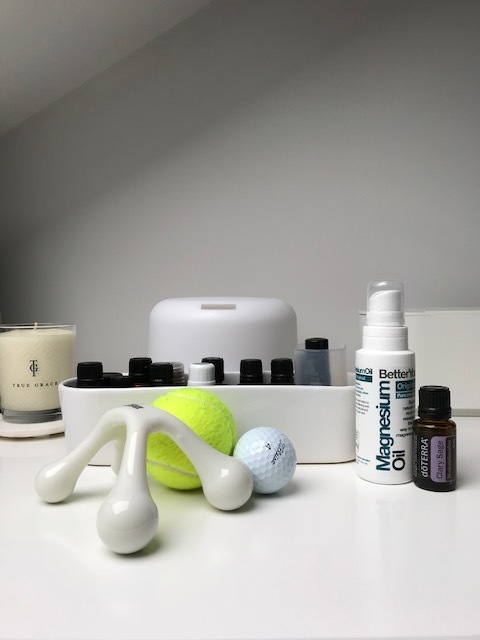 I have my favourite scented candle and massage tools - a tennis ball is great for rolling up and down the back, and a golf ball eases a lot of tension underneath the feet! There's yoga equipment, an all important kettle for raspberry leaf tea during the birth, and hot water bottles so I feel all prepped! I’ve been practicing my hypnobirthing a few times a week, and I am feeling really positive about the birth! I usually practice before I go to bed or whilst I am having a nice warm bath. If I practice before I go to bed, and it has been a tiring and stressful day, I usually spray some magnesium on my belly which helps calm me down. I have made an effort to read some books on pregnancy/childbirth. Of course the Katherine Graves book you gave us on the course has been great, I’ve just finished the Positive Birth book has been really informative and easy to read - and covers pretty much everything you can think of. You mentioned on the course about putting positive affirmations around the house, and I invested in some yesmum cards which I keep on my bedside table. It is lovely to read a positive statement every morning which sets the tone for the rest of the day, or makes you think about pregnancy and birth in a way you hadn’t considered before. Lastly I have just started Ina May Gaskin’s book which I am glad I have left to the last few weeks of the pregnancy. It is lovely just to read some quick positive birth stories before bed. There is great story about how one woman visualised a cave with water rushing in and out every time she had a surge, which I think I will use when it comes to the time! I know that practicing hypnobirthing is working well for me, as over the last few weeks I have been having Braxton Hicks and practicing my breathing techniques through this has helped enormously. Unlike with my first birth, where the Braxton Hicks were extremely painful, the Braxton Hicks which I am experiencing now are completely manageable and although feel a bit strange, do not feel painful. The focus on breathing and positive, calming visualisation distracts your mind from the funny sensations and changes your body goes through, and it is great practice before the actual birth. Thank you so much for the course, that day really helped us and made us think about how we wanted to progress and move forward with a positive birth and really was so informative. We will keep you up to date with how things go and if the home birth actually happens, but if not, I feel much better about going into hospital again and knowing how we would approach things differently! I’d love to hear more examples of ways to practice hypnobirthing in pregnancy, so please do share!